Legend has it that Skopelos was founded by Staphylo, (meaning grape), son of Ariadne of Crete and Dionysos, god of wine. This is why Skopelos is a well-known wine producing island. It is found in the North Sporades between the islands of Skiathos and Alonissos. It spans an area of 96 km2 (36.6 mi2) and in 2001 it had a population of 4.696. Capital and main port of the island is Skopelos town on the Southeastern part of the island. Glossa and Klima, both on the Western side are the two largest settlements of the island however Stafilos, Agnondas, Panormos, Atheato and Loutraki are also very characteristic villages. The island has also many pebbled beaches such as, Milia, Velanio, Limnonari, Elios, Hovolo, Glyfoneri and many more worth visiting. Interesting information about Skopelos can be found through the Greek Travel Pages (GTP) and Wikipedia. 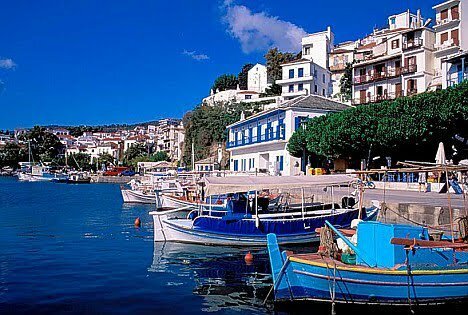 Skopelos, which is situated on the southeastern side of the island. Loutraki (or Glossa), which is situated on the northwestern side of the island. There are busses that connect the ports with the rest of the island. Ferry connections and schedules for domestic routes, like to Skopelos, are usually announced by most shipping companies, a couple of weeks before the beginning of each season. There are some exceptions though, like Blue Star ferries, which announces schedules in the beginning of the year. Information concerning ports serving routes to Skopelos can be found further down.